Sleek and sporty, the new 2019 Honda Civic Si Coupe was designed to offer the performance of a sports car, with the everyday practicality and affordability of a standard coupe. Learn more about the impressive performance and engine specs you can expect from the new 2019 Honda Civic Si Coupe. The new, sporty coupe version of the 2019 Honda Civic Si features a powerful direct fuel injection, inline 1.5-liter 4-cylinder engine with turbocharger. This impressive engine is capable of creating up to 205 horsepower and 192 lb-ft of torque for an exciting and engaging driving performance. Delivering a dynamic performance is the model’s standard 6-speed manual transmission with helical limited slip differential. If you’re interested in learning more about the new 2019 Honda Civic Si, be sure to check out the rest of the Continental Honda Blog, where we cover various aspects of our available models as well as some of Honda’s upcoming vehicles. The newest version of the 2019 Honda Civic Si Coupe recently arrived on our lot here at Continental Honda and is now available to test drive. Just take a moment to browse our inventory to see the vehicles that are currently available for shoppers to choose from. From there, you can set up a test drive by calling our sales staff, by visiting our location in Countryside, Illinois, or by filling out an online contact form. We’ll be happy to work with you to set up an appointment that works with your busy schedule. We look forward to hearing from you! 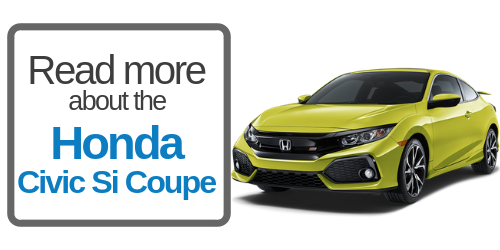 What do you think of the new 2019 Honda Civic Coupe? What colors does the Civic Hatchback come in? This entry was posted on Tuesday, February 5th, 2019 at 10:33 AM	and is filed under Honda Civic, Honda Civic Si. You can follow any responses to this entry through the RSS 2.0 feed. You can leave a response, or trackback from your own site.